Synopsis: As fears of an alien invasion grow, Earth's International Fleet recruits an unlikely leader - a young and brilliant boy - to command its forces and fight for the future of the human race. 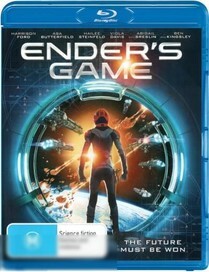 Based on the worldwide best seller and featuring an all-star cast, Ender's Game bursts with epic adventure and stunning visual effects. ex-rental. good condition. Bluray Only.